NASHVILLE, Tenn. (May 22, 2012) – Blaster Records, in association with Warner Music Nashville, announces the details of the upcoming Hank Williams, Jr. album set for release on July 10, 2012. The twelve-song package, available for pre-sale now at www.hankjr.com, will include a duet with Brad Paisley on “I’m Gonna Get Drunk And Play Hank Williams” as well as a new duet with the legendary Merle Haggard on his classic “I Think I’ll Just Sit Here and Drink.” Williams’ first single in several years, “That Ain’t Good”, has just been shipped to radio with a companion video being produced in coming weeks. 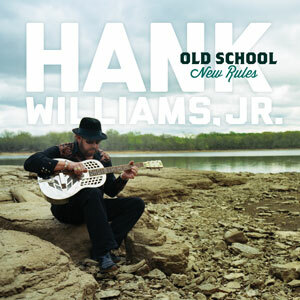 “Old School, New Rules” is the first album on Hank Williams, Jr.’s new label imprint, Bocephus Records, with a licensing deal with Blaster Records under a Warner Music Nashville distribution deal. With more than 70 albums to his credit, sales of 55 million records, countless awards including 5-time Entertainer of the Year awards (ACM & CMA), BMI Icon Award, a Grammy, and most recently in 2009 the Academy of Country Music “Pioneer Award,” Williams is a living legend. His discography chronicles a bold profile of growth from adored offspring of a legendary father, to titan of the modern country rock movement in his own right. For two decades, America came to its collective feet each fall Monday night when this larger than life superman of a musician looked into the camera and unleashed the national anthem for viewers of Monday Night Football – ‘Are You Ready for Some Football?’ Those simple words have won Williams an entirely new generation of fans and given him the distinction of being the first country performer to ever win an Emmy.